Xiaomi Redmi Note 5 Pro is a smartphone which is perfect for those who want to get the best without spending much. It comes with a great display, build quality, runs smoothly and never slows down. The battery life is just killer and the speaker is really loud. Talking about performance, this device comes with a fast processor which is a good thing. I totally really recommend this phone. The smartphone comes with minimal bezels on the sides and also features selfie flash light for selfie lovers. The handset appears sturdy and boasts of good built quality. Call quality is pretty good and audio experience is also decent on both speakers and headset. Charging of phone is very fast even though there is no claim in the specification section. The overall phone gives money to features value to the customer. Cameras are not up to the mark under low light. Xiaomi Redmi Note 5 Pro is another budget smartphone from Xiaomi. Looking for a device which is not going to put a weight on your pocket and still delivers top of the line specs? This device might be what you&apos;re looking for. When it comes to build quality, the device looks great and comes and somewhat gives you a good feel. Not a fan of Xiaomi&apos;s build quality though. As far as the other specs are concerned, you&apos;re getting pretty good hardware. 48 Pricebaba users have written their experience with Xiaomi Redmi Note 5 Pro. 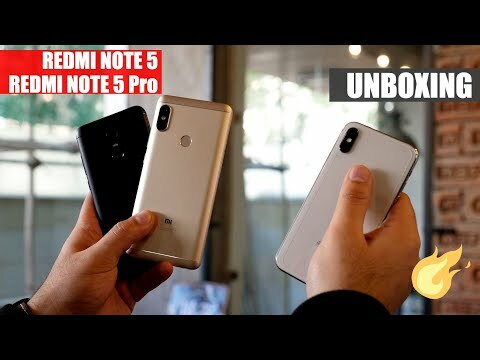 If you own Xiaomi Redmi Note 5 Pro, please do leave your feedback too. Lowest price of Xiaomi Redmi Note 5 Pro price in India starts at Rs. 11,499 Xiaomi Redmi Note 5 Pro is available on Flipkart at Rs. 12,499 and on Amazon at Rs. 11,499. Prices updated on 24th April 2019. The Redmi Note 5 Pro is a completely new phone in the series which saw its global launch in India during the 2018 Xiaomi event. The phone comes with advanced specifications and is priced meagerly in the mid-budget price range. This is also the first phone in the world to come with the Snapdragon 636 chipset, which is very impressive in this price range. Let's see what the Note 5 Pro has in store for its users. In terms of aesthetics, the Redmi Note 5 Pro bears an iPhone X-like design when seen from the rear, due to its camera setup. The phone is available in three different colours: Black, Gold, Lake Blue and Rose Gold. On the front, there are thin bezels and most of the portion is occupied with the 5.99-inch display. It bears a Full HD+ resolution which takes the pixel density to around 400 PPI. The display is also protected with a Corning Gorilla Glass sheet for durability. There's a dual-rear camera setup on the back which is positioned in a vertical alignment just like the iPhone X. The setup consists of a 12-megapixel sensor coupled with another 5-megapixel one. This helps the phone in clicking portrait mode pictures and do much more. Even on the front, there's a superior 20-megapixel camera which is paired with a soft selfie light for low-light selfies. You can also click portrait selfies via the front camera. Moreover, it also lets you unlock the phone via authenticating your face. The Redmi Note 5 Pro promises a superb performance, all thanks to the fast Snapdragon 636 processor. It is further coupled with 4GB of RAM to allow seamless multi-tasking. If you are looking for more RAM, there's another 6GB variant of the phone as well. This particular model comes with 64GB of internal storage, but is expandable up to 128GB via a microSD card. The phone runs on Xiaomi's custom MIUI 9 which is layered on top of Android Nougat. An update to Android Oreo can be expected soon. The phone packs in a massive 4000mAh battery unit which is good enough to last at least a day. The phone offers fast charging as it has Quick Charge 2.0 support. Coming to connectivity, there is support for 4G VoLTE, WiFi, Bluetooth, 3.5mm headphone jack and a Micro USB port for charging. Ans: Yes, it will work with Reliance Jio network. Ans: Yes the phone has a hybrid second slot. Ans: Yes, you can expect at least one more software update for this phone. Ans: It has an impressive 20MP selfie camera which promises great pictures from the front camera. Ans: Yes, the phone has support for USB OTG.